even if the White House is also negotiating with Russia [here] on how to deal with President Assad now that its ally Turkey has pivoted to Russia immediately prior and after the failed military coup against Erdogan. This does not mean that Erdogan suddenly realized who is the lesser geopolitical evil in the region, but himself is fighting for his own political survival [here] considering that at least half of the hugely divided population in Turkey is not with him. His role with the Islamic State’s Syrian oil smuggling is not easy to forget especially when its Operation Euphrates Shield facilitated the escape of Daesh Islamic State terrorists instead of crushing them as Erdogan is now claiming. Another interesting development is the confirmed joint US-China Coast Guard patrols in the West Philippine Sea/South China Sea [here]. This two-faced US engagement in geopolitics around the globe is very characteristic with Janus worshipers. 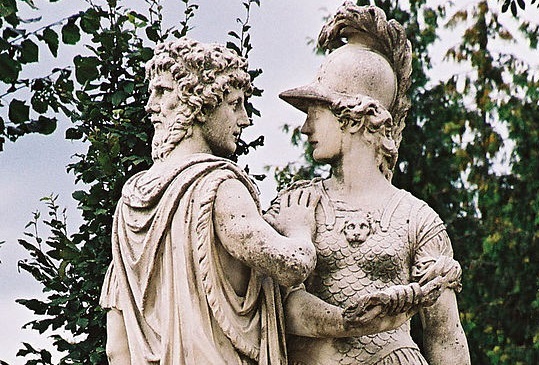 The two-faced Janus shown above is negotiating for peace in situations not of his complete control, and yet is looking for war in other vulnerable places, e.g. the Syrian borders, Ukraine-Crimea border, and Korean borders. While the Khazarian criminal infrastructure is still projecting power around the globe, it is very clear that the criminals are already in panic and the whole enterprise is already in its dying throes. The desperation as shown by the constant repetitions of old scripts like false flag operations, persistent attempts at passing TPP, and other trade agreements, all suggest they have ran out of ammunition and their only hope right now is the rigging of the US elections in favor of their murderous queen, the mentally sick sociopath, Hillary Clinton, and to some extent, the “lesser evil” Donald Trump. We, however, prefer to see the United States be presided by a peaceful Jill Stein for a more radical and peaceful change. Obviously, the mainstream media is having a hard time trying to pin her down for she knows precisely the well-grounded practical solutions to the prevailing problems that the United States is suffering from right now, as opposed to the vague rhetorics of the “frontrunners”. This makes us wonder why is their not a peaceful revolution through her candidacy with barely a few months to the elections. Entrada anterior2040, from human enhancement to human … obsolescence?